January 3, 2015  The explorer's life plays out like an adventure film. But before she ever went diving with great whites, she was cheering for the Miami Dolphins — until a required science course changed her plans. April 26, 2014  Earl Morrall, who played an integral role in the Miami Dolphins' perfect season of 1972, died Friday at age 79. 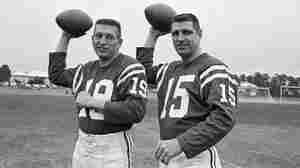 Morrall played 21 seasons in the NFL. January 15, 2014  A Florida vacation got off to an odd start for Judith Fleissig, 58, of Rochester, N.Y., when she and her daughter realized the car they'd rented had an AR-15 semiautomatic rifle. More oddness followed: The gun was left there by the wife of Miami Dolphins quarterback Ryan Tannehill, police say. November 10, 2013  Richie Incognito was suspended by the Miami Dolphins for allegedly sending threatening messages to a younger teammate. The story surfaced a conversation about bullying, race and the culture inside the NFL. November 7, 2013  As the NFL investigates, a player who was with the team in recent years writes that "the most outlandish lie" is that Dolphins coaches didn't know what was happening. 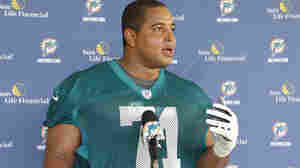 If Richie Incognito had been hazing teammate Jonathan Martin it would have been known, writes Lydon Murtha. November 4, 2013  Veteran guard Richie Incognito is alleged to have left intimidating messages and texts on the phone of second-year offensive tackle Jonathan Martin, who left the team last week. The NFL and the Dolphins have transcripts of some of the messages. December 13, 2010  A strength and conditioning coach for the New York Jets tripped a player for the Miami Dolphins on Sunday during the third quarter of their game at New Meadowlands Stadium.